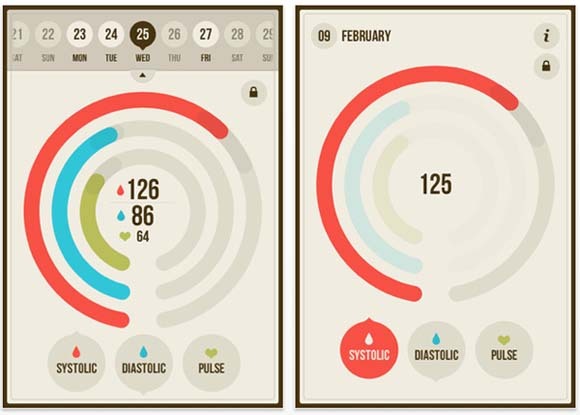 The new slick (and very good-looking) application Bloodnote makes tracking and monitoring your blood pressure quick and simple. There are a number of apps available that are designed to give you more control over your health, allowing you to track and monitor everything your body gets up to throughout the day. However, many people don’t need to know how many calories they’ve eaten, steps they’ve taken and times they’ve exhaled, sometimes an all-singing, all-dancing app isn’t really the best answer and that’s why niche solution Bloodnote could be really popular among those that want to keep track of their blood pressure and nothing else. Many people have their blood pressure monitored regularly, even if they don’t have a serious health problem, but often these results are kept by doctors as paper records or in a computer system you wouldn’t be allowed access too. Bloodnote aims to give people control over this data and allows them to easily track their blood pressure readings using a simple interface that looks good and is really easy to use, just swipe your finger around the dial to input the necessary information. You can input the values each day and there’s a simple calendar running along the top of the app so you can keep track of everything easily and find the right data quickly, which is ideal if you need to show a doctor or medical professional your history fast. The app is simple and isn’t a one-stop-shop for your health, but it’s perfect for those who need to monitor their blood pressure and want an easy way to do if from the palm of their hand. However, there are a number of new features in the pipeline too, like the ability to export data and, most importantly, a way to connect the app up with external blood pressure monitoring devices so you can have even more freedom over your health in the future. Available from the app store for £1.49.